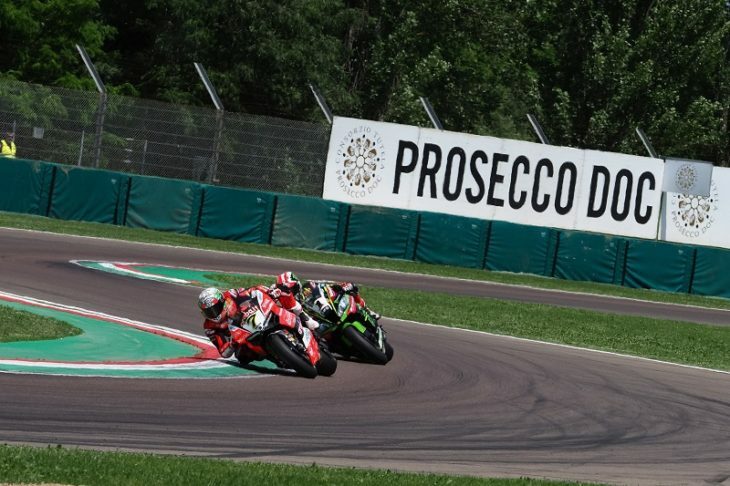 Jonathan Rea (Kawasaki Racing Team WorldSBK) has won Race 2 at the Autodromo Internazionale Enzo e Dino Ferrari di Imola, equalling Carl Fogarty for the most wins in the MOTUL FIM Superbike World Championship in the process. Victory number 59 came after a stunning battle with Chaz Davies (Aruba.it Racing – Ducati), who fought off several attacks from the reigning champion before having to settle for second place. The battle had been anticipated all weekend, but it was Michael Ruben Rinaldi (Aruba.it Racing – Ducati) who made the early move, flying out from the blocks and taking the lead ahead of Davies. The Welshman kept close behind however, finally making his move at Variante Bassa at the end of lap 3. By then, Rea had made it up to third, and a few bends later, at Tosa, passed Rinaldi and set up the fight. For nine laps, it was cat-and-mouse game, with barely a tenth of a second separating the two. For several laps, Rea stalked Davies, creeping up and planning his pass. He fired the first shot at Tamburello on lap 10, going wide and allowing Davies back through by the straight. Shot two came at Tosa two laps later, and it couldn’t have been closer. Rea found the pace he needed around Tosa, but Davies took the inside line. The pair touched, Rea went wide, and the Ducati stayed in front. It was third time lucky for Rea, however, one lap later, at the entry to Variante Alta. From there on, the fired-up reigning champion put on an incredible display, giving Davies no chance to even answer back, and increasing the lead to four seconds by the checkered flag. Behind the flying duo was Tom Sykes (Kawasaki Racing Team WorldSBK), completing an all-British duo for the first time this season. Sykes had a beautiful battle with Xavi Fores (Barni Racing Team) throughout the race, finally managing to make it past the Spaniard, who finished fourth, with three laps to go. Before that, Marco Melandri (Aruba.it Racing – Ducati) and Michael van der Mark (Pata Yamaha Official WorldSBK Team), who had been contending for that final podium place, came together on lap 10 around Rivazza. The pair collided and ended up on the gravel, neither man able to return. Jordi Torres (MV Agusta Reparto Corse) scored his best result of the season with a scintillating fifth place finish, after starting on Row 4. One place behind him on the grid and finally at the flag, Alex Lowes (Pata Yamaha Official WorldSBK Team) came in sixth, equalling his best Imola result. Rinaldi also equalled his Race 1 result in seventh. The Italian was unable to keep up his initial pace, but comes out of the Pata Italian Round with his best return over two races in WorldSBK. He beat Toprak Razgatlioglu (Kawasaki Puccetti Racing) to the flag, also matching his best WorldSBK result. In ninth, Eugene Laverty (Milwaukee Aprilia) made his return from injury a successful one. Leandro Mercado (Orelac Racing VerdNatura), closed the top ten, with one of his best performances of the season.